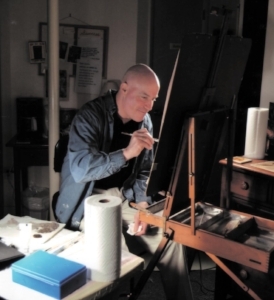 As a visual artist, Alan paints mostly abstracts, and will occasionally throw in some still life and plein air landscapes. Alan has been creating art since he was a small child (many children are small). His first painting was "Popeye the Sailor" with enamel paints on wood. His hobbies included building model cars, sketching cars, and racing….radio controlled cars. Alan has participated in many exhibitions and is honorable mentioned and award winning. He has also done many solo shows, festivals, and commissions. Art is an outlet from the everyday. It is relaxing and invigorating and In a world of being connected virtually 24/7, art gets Alan to a quieter, more serene place. Story telling through the use of flowing color and movement. That’s what Alan does, but really what he wants is to engage the viewer to create their own story and find imagery within the art. The colorful and organic paintings create movement, evokes thought, and lets your mind tell it’s own story, seeing imagery within the flow of colors that brings happiness to your mind and soul. No matter how the paintings are viewed, there will always be a different story to tell. The process requires controlling the fluid movement of color to slowly move and self level on it’s own or by means of manipulating it with various tools or tilting the support in many directions to get a more aggressive movement of color. His day job is the printing of custom labels. Ink and color is an all day, everyday theme. The use of water based industrial pigment to create his own colors within an acrylic vehicle gives Alan the freedom to experiment, and with that, create a unique technique; flows of color on wood panels and Plexiglas that cure to a high gloss finish…. calling them, “Fluid Acrylic Happiness”, or "the Calm within the Movement".